This picture of a large Orca Whale showing his tail was taken on a whale watching tour from Telegraph Cove on Northern Vancouver Island. Telegraph Cove is located just west of the Robson Bight Reserve. Whale watching tours are leaving from Telegraph Cove on a daily base in the season between June and October. 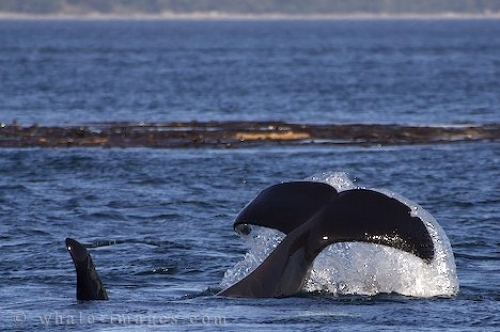 This photo shows the tail of a Northern Resident orca Whale. Picture of a Orca whale showing is tail in Johnstone Strait in British Columbia, Canada.